Sola Sisters: A Review of David Platt's "Radical"
"(T)oday evangelism is losing its way in the maze of the social agenda as more and more time and resources are being poured into alleviating physical suffering rather than uprooting the cause through the gospel." Pastor Gilley's entire review can be read here. My issue with Platt's book is that there seems to be a subtle form of "missions pietism" undergirding this book. I get a sense from Radical that unless you sell everything to go take care of orphans behind enemy lines while taking incoming fire, you're sort of a "second-tier Christian." I'm kind of kidding with my analogy there, but then again, kind of not.... As Gary Gilley wrote above, there are definitely mixed messages in this book. The ordinary Christians who live in America and take care of their families and work at their jobs are just as "Christian" as the behind-enemy-lines "Super Christians." Bottom line for me: Doing good things in Third World countries is not the gospel. The gospel is a distinct message that gives life to the spiritually dead. The whole world will rush to love you and embrace you and give you kudos for digging wells, dispensing medicine and helping set up infrastructure (being "Missional"). And please understand what I'm saying here: none of these things are wrong to do. We should help the poor, we should help the widowed, we should help the orphaned. But these things are not the gospel. Missions must ALWAYS be done for the purpose of gaining a platform for sharing the gospel message. And for some Christians, the harder thing might actually be to stay here in the U.S. and do the less dramatic - but still Godly - things: lovingly and faithfully serving our families, raising our children in the nurture and admonition of the LORD, working at a less-than-exciting job to pay the bills, etc. 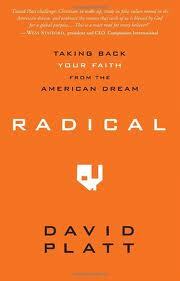 Are the mixed messages from David Platt's book Radical contributing to a kind of "Missions Pietism" in the making? It seems that way to me.